The silver medalist under-16 Coxed Four – Nicholas Bonthuys, Phoenix Griessel, Aiden Buck, Liam McCourt and Cuan Thompson. 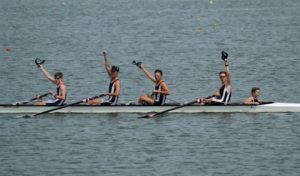 The first half of the rowing season ended on a high note for Jeppe when they came third in the team placings and won nine medals at the Gauteng Schools Rowing Championships at Roodeplaat Dam. The third place meant that they were the top State school in the final team standings and the nine-medal haul – one gold, four silver and four bronze – was their best performance at the championships for many years. The gold medal was won by the team captain, Sebastian Prince, in the under-19 single sculls. He was also part of the crew that took silver in the under-19 coxed four. The silver medals were won by the under-19 Coxed Four – Sebastian Prince, Dameon Westley, Cameron Correia de Araujo, Jaydin Crickmore, Zain Saeed; the under-16 Coxed Four – Nicholas Bonthuys, Phoenix Griessel, Aiden Buck, Liam McCourt, Cuan Thompson; the under-15 Double – Kegan Kirkland, Reece Arran and the under-14 Single Scull – Mandla Green. Of the 20 events entered by the school, Jeppe progressed to the A finals in 19. In the under-19 four, under-16 single sculls; under-15 four, and under-15 double there was more than one Jeppe boat in the A final so in the end 24 Jeppe crews raced in A finals. Jeppe’s master in charge of rowing, Mr Devin Cripwell, is happy with the progress that the sport in making at the school. “These have been our best results at Gauteng Champs for some while,” he said. “Last year we only won three medals at this event. More important is the fact that we got so many boats into A finals, that shows that we are building up our strength in depth which is the only way to be competitive. The parents have been very supportive and through their hard work the school has increased their number of boats, with is an essential key to success, Mr Cripwell said. The next assignment, for the first eight any way, is the Schools Boat Race in Port Alfred in December, while the entire club will be back at work, before school even begins next year. Jeppe rowing is certainly on the up. Final Points Standings – St Benedict’s 510, St John’s 323, Jeppe 272, KES 233, St Stithians 190, St Alban’s 153, Parktown 149, Hilton 87.